The SlimLine A6020 is a latest generation portal system for conveyor belt-based UHF RFID applications. Easily installed into existing infrastructure, the A6020 incorporates a high performance, ultra-low profile underbelt antenna, plus three low profile antennas positioned side and top of a conveyor to create a high performance RFID portal. With a highly focused and balanced field the A6020 is optimised to read RFID tags directly on, or close to, the conveyor with incredible accuracy. The SlimLine A6020 can achieve industry leading read and assignment rates of no less than 99.5%. 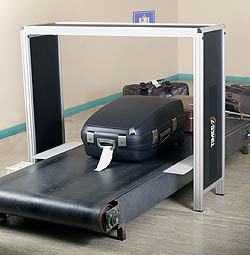 With flexible mounting and connection options available, the A6020 is custom designed for airport baggage handling conveyor systems, and all conveyor belt-based applications where a high performance, cost effective UHF RFID portal solution is required.